Image caption Tha dùil ris an MV Clansman ann am Bàgh a' Chaisteil aig 2:00f Diciadain, 's feumaidh an MV Isle of Lewis a bhith air a toirt far a' chidhe airson a leigeil a-steach. Tha seirbheis ChalMac eadar Barraigh agus an t-Òban dheth Diciadain a-rithist agus luchd-einnseanaireachd fhathast ri obair-càraidh air slige an t-soithich ann am Bàgh a' Chaisteil. Cha do sheòl an MV Isle of Lewis bho Dhidòmhnaich agus cha mhotha a sheòl am bàt'-aiseig air an t-slighe eadar Loch Baghasdail agus Malaig feasgar Dimàirt air sgàth thrioblaidean teicnigeach. Chan fhaigh soitheach eile a-steach dhan chidhe ann am Bàgh a' Chaisteil fhàd 's a tha an Isle of Lewis ann. 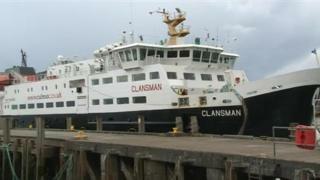 Tha dùil ris an MV Clansman mu 2:00f Diciadain, agus gum bi an MV Isle of Lewis air a gluasad ron àm sin airson a leigeil chun a' chidhe.